Griesbach, R.J. 2002. Development of Phalaenopsis Orchids for the Mass-Market. p. 458465. In: J. Janick and A. Whipkey (eds. ), Trends in new crops and new uses. ASHS Press, Alexandria, VA. It is widely recognized that potted Phalaenopsis production has increased tremendously in last few years. The specific statistics for Phalaenopsis are not available, for the US Department of Agriculture only keep records on total orchid production and sales. However, over 75% of all orchids sold are Phalaenopsis (American Orchid Society, pers. commun.). In 2000, wholesale orchid sales were approximately $100,000,000 (Fig. 1). The only crop with a higher value was poinsettia. During the last five years orchids sales has been increasing, unlike all the other ornamental crops (Fig. 2). Fig. 1. Wholesale value of flowering potted plants within the United States for 2000 (USDA Agricultural Statistics). Fig. 2. Wholesale value of orchids within the United States for the last five years (USDA Agricultural Statistics). Large scale, potted Phalaenopsis production is occurring in the Netherlands, Germany, China, Taiwan, United States, and Japan. In one cooperative venture, cultivar development is taking place in the Unites States; selected clones are being placed into tissue culture in Japan; mass proliferation of the tissue cultures is occurring in China; and the tissue cultured plants are being grown to maturity in the Netherlands. In 1957, James Shoemaker stated that orchid growing has not fully achieved the transition from a hobby to an industry. Today, orchid growing is more than just an industry, it is an international business. The development of hybrids reflects the preference of the consumer. As consumers taste change, so does the type of hybrids produced and grown. During the Victorian period from 1830 to 1900, many homes had parlor plants (Martin 1988). During this period, the design of homes changed from a large single room to several smaller multiple-function rooms. Plants were grown in either the front or back rooms or parlors. The front parlor usually lacked heat and was extremely cold during the winter; while, the back parlor was typically overheated during the day and not heated at night. Many of the modern potted plants which we consider new were common house plants at this time. Several orchid species in the Cattleya Ldl. and Dendrobium Ldl. alliances were also common parlor plants. has been one of the most difficult cultural problems horticulturists have been called upon to solve. Because of the environmental conditions within the home, Phalaenopsis were predominantly grown in a conservatory or greenhouse. Many homes in Europe at this time had greenhouses. In 1870, 50% of the middle and better class homes in London had attached greenhouses (Martin 1988). However in the United States, greenhouses were extremely expensive and rarely found. Because of this difference, Phalaenopsis were not as widely grown in the United States during the Victorian period. The popularity of Phalaenopsis naturally led to the creation of many artificial hybrids. The first hybrid (P. Intermedia) was created in 1875 when John Seden at Veitch and Sons Nursery in England crossed P. amabilis (L.) Bl. with P. equestris Rchb. (Veitch 1886). The seed was sown at the base of the mother plant and only a single seedling survived which flowered a decade later in 1886. By 1900, an additional 13 primary hybrids were created and flowered. John Seden was responsible for creating all but one of these hybrids. The emphasis in hybridization at this time was to create exotic parlor plants. The potential of artificial hybridization for creating new types was widely recognized, but the technical expertise required to germinate the seed and to raise the seedlings to maturity precluded its wide spread application. Only a few individuals were successful until 1909 (White 1942). In 1909, Hans Burgeff from Germany and Noel Bernard from France independently reported that orchid seeds germinated only in the presence of a symbiotic fungus. This discovery was used by Joseph Charlesworth and James Ramsbottom at the Charlesworth Company in England to develop a practical procedure to symbiotically germinate orchid seeds. In this procedure, a peat and sand mixture was sterilizing and then inoculated with the symbiotic fungus. After the fungus has penetrated the compost, the seed was sown on top. This symbiotic germination technology made it easier to produce hybrids, but large scale, commercial production of hybrids was still not possible. Many of the seeds in a capsule germinated, but few survived the process due to excessive fungal infection. Symbiotic germination methods were only used for a short time before being replaced by non-symbiotic germination procedures. In 1922, Lewis Knudson at Cornell University reported that the fungus was not required for germination if the seed was sown on agar containing appropriate salts and sugars. His Knudson C medium is still being used to germinate the seed of some species. With non-symbiotic germination technology, thousands of seedlings could be raised to maturity from a single seed capsule. Besides the obvious potential in breeding, this technology was also extremely important for vegetative propagation. Unlike Cattleya, Phalaenopsis plants were difficult to import because they lacked water storage pseudobulbs. Many of the plants died in transit. Those plants which did survive were difficult to vegetatively propagate. The most desirable species (i.e. P. amabilis) produced a single stem that would produce only a few off-sets. Non-symbiotic germination technology made it possible to produce very large quantities of plants. By the time these new seed germination procedures were developed, the parlor plant craze had ended. Consumer preference shifted from potted plants to cut-flowers. Therefore, the emphasis in breeding focused on developing hybrids for this new market. Improved germplasm collected by Regnier in the Philippine Islands served as the genetic foundation for the cut-flower hybrids. Two improved forms of P. amabilis were collected. The grandiflora form of P. amabilis produced flowers that had fuller, rounder form with wider petals than the typical species. The rimestandiana form produced flowers that had the typical form and size but had tremendous substance. The rimestandiana forms that were used in breeding were later found to be tetraploid (Maurice Lecoufle pers. commun.). These two forms were originally recognized as distinct species. The first major advance in breeding was made in 1920 by Dr. Jean Gratiot from France when he registered P. Gilles Gratiot. This hybrid, the result of a cross between the typical form of P. amabilis and the rimestandiana form, had extremely heavy substance. The second major advance in breeding came in 1927 when Henri Lecoufle at Vacherot and Lecoufle Company in France registered the hybrid between the rimestandiana and grandiflora forms of P. amabilis. This hybrid, P. Elisabethae, had the heavy substance of the rimestandiana from and the improved flower shape of the grandiflora form. Through extensive in-breeding and out-crossing to P. aphrodite Rchb. superior hybrids were created, the most important of which was P. Doris. This hybrid was registered in 1940 by Duke Farms in New Jersey. P. Doris produced long, arching inflorescences on plants that were large and vigorous. The flowers were pure white, huge, and flat. Their heavy substance made them ideal for cut-flower production. Once cut-flower hybrids were developed, research began on developing commercial production protocols. The first experiments were preformed in the 1930s by H.O. Eversole in California (White 1942). He determined that Phalaenopsis grew the fastest and produced the most flowers in a sand-peat medium. Prior to this time, nearly all orchids were grown in living moss. Because of the difficulty in obtaining high quality peat, osmunda fiber became the medium of choice during the 1940s. Repotting orchids in osmunda fiber was both difficult and labor intensive. During the 1950s, independent research by O. Wesley Davidson at Rutgers University working with George Off at the Off Orchid Company and by Rod McLellan at the Rod McLellan Company resulted in the development of bark-based media. With these media, repotting was fast and easy. Today, the Rutger #3/Off mix is the most popular bark medium used. Coupled with the development of improved potting media was the formulation of better fertilizers. Research on nutrition by Ratsek (1932), Evers and Laurie at Ohio State University (1940), Withner at Brooklyn College (1942), Fairborn at the Missouri Botanical (1944), Beaumont and Bowers at the University of Hawaii (1954), Davidson at Rutgers University (1957), and Sheehan at the University of Florida (1960) resulted in improved fertilizers. Before 1960, few growers fertilized their orchids. These studies showed that fertilization was critical for commercial production. Another important research discovery was made by Gavino Rotor at Cornell University. In 1952, he reported that short days induced flowering in P. amabilis hybrids and that high temperatures inhibited flowering. All of this data was used to develop improved production protocols which increased the rate of plant growth and the yield of cut-flowers. Between 1930 and 1950, the predominant cut-flower market was for white flowered hybrids. One of the reasons for the predominance of white flowers was the lack of quality hybrids in other colors. Pink cut-flower hybrids were developed during the 1950s. Interestingly, the genetic background of these pink hybrids was not significantly different than that of the white hybrids. The pink species (P. schilleriana Rchb. and P. sanderiana Rchb.) were not suitable for cut-flower production because of their thin substance. In addition, these species quickly wilted if the pollen was accidentally removed or disturbed during harvest. Many of the cut-flower pink hybrids that were developed actually arose from P. amabilis. Phalaenopsis amabilis is not completely white, but has a pink flush on the back of its sepals and petals. Through inbreeding and intense selection, hybrids were eventually developed that were solid pink in color. These pink forms of P. amabilis (i.e. P. Doris) were then used in breeding with P. schilleriana and P. sanderiana to create quality hybrids. By 1960, only a handful of closely related species (P. aphrodite, amabilis, schilleriana, and sanderiana) were in the background of nearly every hybrid created. The other species or novelty species were rarely used in breeding. Oscar Kirsch (1960) in Hawaii stated of novelty hybrids that many of these new creations would not be of value as commercial flower producers. There were many reasons why they were of little value. First, the commercial market demanded cut-flower plants that produced long inflorescences with lots of large flowers. Novelty hybrids usually produced short inflorescences with a few small flowers. Second, the growers needed uniformity in both the product and production of the product. Populations of novelty hybrids generally contained plants that flowered at different times, had different growth habits and had different flower colors. Third, the cut-flower market wanted flowers that were uniform in color and not patterned. Many novelty hybrids produced flowers that had unusual colors. In order to develop cut-flowers in an expanded range of pure colors without markings, the novelty species had to be used. Although the breeding protocol to create the colored cut-flower hybrids was obviouscross the novelty species with the white, cut-flower hybrids and then backcross to the white parentthe problems associated with this approach were not. First, there were few novelty species in cultivation. Second, there was no experience on the genetic influence of the novelty species in breeding. Third, the modern primary hybrids were not very fertile due to chromosomal problems. The original primary hybrids made prior to 1900 used diploid forms of P. amabilis; while the modern recreation of these hybrids used tetraploid forms of P. amabilis (i.e. P. Doris). The first novelty species to be used extensively in hybridization was P. equestris. This species was used to create a unique flower that had white petals and sepals with a red lip. The first P. equestris × P. amabilis hybrid was made by Seden in 1875 and had diploid parents. Its flowers were pale pink with a solid, dark red, lip. They were not flat and had poor substance and open shape. When a tetraploid, white, cut-flower hybrid was crossed with a diploid P. equestris, the results were quite different. These hybrids produced flowers that were nearly white with a pale red, stained lip. The flowers were reasonably large with heavy substance, but had poor shape. The most important of these hybrids was P. Sally Lowrey (P. equestris × P. Pua Kea). This hybrid was registered in 1954 by Oscar Kirsch in Hawaii. Through intensively backing-crossing of P. Sally Lowrey to white hybrids followed by sib-mating, improved forms were created that were pure white with dark red lips. In addition, these flowers had the improved form, size, and substance of the cut-flower hybrids. During the 1960s, consumer preference shifted from cut-flowers back to potted plants. The parlor plant craze was reborn. Unlike Victorian homes, modern homes were ideally suited to growing Phalaenopsis. Novelty species were now used to create their own unique hybrids and not just for introducing color into cut-flowers. All of the species were re-introduced into cultivation and many were improved through intraspecific hybridization. In several instances, polyploid forms of the novelty species were created. These improved species were used to create primary hybrids that were far superior to those created at the turn-of-the-century. Experimental crosses determine the genetic influence of the various species. For example, it was discovered that the brown spotting found on P. amboinensis J.J.Sm. flowers was not expressed in its hybrids with P. amabilis; while the spotting in P. mannii Rchb. was expressed. Additional studies showed that certain species combinations produced new characteristics. For example, when the solid colored P. pulchra Rchb. was crossed to hybrids with fine spotting, the progeny had large blotches of colors. All of this information and experience was used to create a wide range of unique hybrids. The first orchid to be commercial marketed in this manner was Vuylstekeara Cambria Plush. In 1975, Klass Schoone from the Netherlands began to propagate this clone for the mass-market. Since conventional methods for vegetative propagation were inadequate, Schoone turned to tissue culture. Orchids were the first plants to be commercially propagated through tissue culture. By 1985, over 100,000 tissue culture propagated plants of V. Cambria Plush were being sold per year! The first experiments in orchid tissue culture were carried out in Knudsons laboratory at Cornell University. In 1949, Gavino Rotor at Cornell University demonstrated that inflorescence nodes from Phalaenopsis could be induced to form a plantlet if aseptically placed on seed germination media. More than a decade later, Georges Morel (1960) at the Central Station for Plant Physiology in France reported that excised Cymbidium Sw. shoot tips could be induced to form multiple plantlets when cultured on seed germination media supplemented with phytohormones. Shortly after this report, Donald Wimber (1963) at Brookhaven National Laboratory developed a successful method of using tissue culture to commercial propagate Cymbidium. Tissue culture techniques that were commercially successful for many orchids could not be used with Phalaenopsis. In Phalaenopsis, tissue culture propagation produced too much genetic variation. In some instances, over 50% of the propagated plants produced flowers that were significantly different than the mother plant. Therefore, mass-market Phalaenopsis were seed, and not vegetatively, propagated. Recently, tissue culture protocols specific for Phalaenopsis have been developed by Tse and others (1971) at the University of California, Intuwong and Sagawa (1974) at the University of Hawaii, Reisinger and others (1976) at the University of California, Zimmer and Pieper (1977) at the Technical University in Germany, Haas-von Schmude (1983) in Germany, Griesbach (1983) at the US Department of Agriculture, Homma and Asahira (1985) at Kyoto University in Japan, Tanaka (1987) at Kagawa University in Japan, Hinnen and others (1989) at the Agricultural University in the Netherlands, Tokuhara and Mii (1993) at Chiba University in Japan, Ernst (1994) at the University of California and Zhou (1995) at Sapporo Breweries in Japan, and Park and others (1996) at Shizuoka University in Japan. These methods, while generally successful, still can not be used to propagate all cultivars. In certain cultivars, these methods still produce too much variation. Due to the tremendous increase in uniformity with vegetatively propagated plants, the future mass-market Phalaenopsis will most like be tissue culture propagated and not seed propagated. Breeding for the mass-market was very different than breeding for the hobbyist or cut-flower markets. In the hobbyist and cut-flower markets, emphasis was placed exclusively on floral traits; while in the mass-market, vegetative characteristics were of nearly equal importance with floral traits. The first Phalaenopsis that were sold in mass-market were cut-flower hybrids that were selected for more compact growth and flowering. The development of hybrids specifically for this market is in its infancy. Currently, Phalaenopsis equestris is being heavily used as parent. Unlike in breeding for cut-flowers, this species is not being used to introduce a single trait (i.e. red lip) into the white hybrids. Instead, the white hybrids are being used to introduce a single trait (i.e. better shape) into the species. The first important hybrid in this line of breeding was P. Cassandra (P. equestris × P. stuartiana) which was made by Seden and registered by Veitch in 1899. P. Cassandra was remade many times, but the break through came in 1978 when Herb Hager at Herb Hager Orchids in California used P. Cassandra to make P. Be Glad. The other parent of P. Be Glad, P. Swiss Miss, was hybrid a between P. equestris and a white with a red lip, cut-flower hybrid. P. Be Glad produced flowers with greatly improved shape and size. The plants, however, were less floriferous and much larger in size. The next step logical step in this line of breeding was obviousbackcross P. Be Glad to P. equestris. This hybrid, P. Be Tris, was registered in 1989 by Frank Smith at Krull-Smith Orchids in Florida. A triploid form of P. Be Tris was recently created by Amado and George Vasquez at Zuma Canyon Orchids in California. The tetraploid form of P. equestris which was used to create the triploid hybrid was produced through chemical treatment. During the 1970s, Robert J. Griesbach (1981) in cooperation with Arnold Klehm at Klehm Growers in Illinois developed procedures for using colchicine to double the chromosome number of Phalaenopsis seedlings. A colchicine-induced tetraploid form of P. equestris was seed propagated and distributed by Klehm Growers, the US Department of Agriculture and the American Orchid Society. Of the seed propagated tetraploids, P. equestris Riverbend was the most widely distributed clone. The triploid forms of P. Be Tris are far superior to P. equestris, with more distinct coloration, better shape and heavier substance. Production protocols that were developed for cut-flowers were not the best for potted plant production. Extensive research in plant physiology by Sheehan (1960) at the University of Florida, Poole and Seeley (1978) at Cornell University, Krizek and Lawson (1979) at the US Department of Agriculture, Sakanishi and others (1979) at Oska University in Japan, Tanaka and others (1988) at Miyazaki University in Japan, Endo and Ikusiuma (1989) at Chiba University in Japan, Ota and others (1991) at Nagoya University in Japan, Doi and others (1992) at Kubota University in Japan, Kubota and Yoneda (1993) at Nihon University in Japan, Porat and others (1994) at the Hebrew University in Israel, and Wang (1995) at Texas A&M University helped to define the precise factors essential for maximum plant growth and development. The practical results of this research was the development of large-scale, production protocols (Fig. 3). Fig. 3. Phalenopsis production. 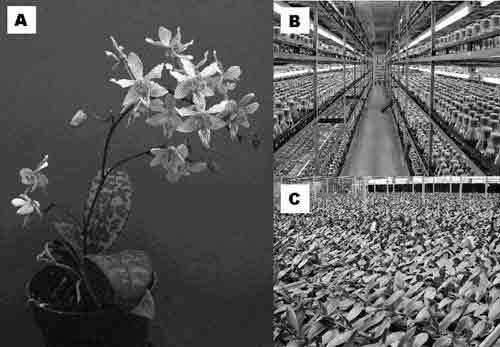 A) dwarf cultivar P. Hummingbird; B) Tissue culture propagation laboratory in Taiwan; and C) Production greenhouse in the Unites States. Phalaenopsis production is now international in scope. For example, in one operation breeding occurs in the United States. Selected clones are sent to Japan where tissue culture progation is initiated. Successful cultures are then sent to China for mass proliferation. In vitro grown plantlets are next sent to the Netherlands for greenhouse production. Finally, flowering plants are returned to the United States for sales. Very few Phalaenopsis are bred, propagated, flowered, and sold in the same country. At this time, production does not meet the demand. It is widely expected that sales will increase as production increases. Demand for Phalaenopsis should continue well into the future as new types are developed. Based upon todays breeding efforts, the cultivars of the future will have a compact growth habit, variegated foliage, fragrance, and be ever flowering. Beaumont, J.H. and F.A. Bowers. 1954. Interrelationships of fertilization, potting media and shading on growth of seedling vanda orchids. Hawaii Ag. Expt. Sta. Tech. Paper 334:16. Doi, M., H. Oda, N. Ogasawara, and T. Asahira. 1992. Effects of CO2 enrichment on the growth and development of in vitro cultured plantlets. J. Japan. Soc. Hort. Sci. 60:963970. Davidson, O.W. 1957. New potting medium lowers costs of production. Am. Orchid Soc. Bul. 26:409411. Endo, M. and I. Ikusiuma. 1989. Diurnal rhythm and characteristics of photosynthesis and respiration in the leaf and root of a Phalaenopsis plant. Plant Cell Physiol. 30:4347. Ernst, R. 1994. Effects of thidiazuron on in vitro propagation of Phalaenopsis and Doritaenopsis. Plant Cell Tissue Organ Culture 39:273275. Evers, O.R. and A. Laurie. 1940. Nutritional studies with orchids. Ohio State Agr. Expt. Sta. Bul. 207:166173. Fairborn, D.C. 1944. Gravel culture for orchids. Missouri Bot. Gard. Bul. 32:116. Griesbach, R.J. 1981. Colchicineinduced polyploidy in Phalaenopsis orchids. Plant Cell Tissue Organ Culture 1:103107. Griesbach, R.J. 1983. The use of indoleacetylamino acids on the in vitro propagation of Phalaenopsis orchids. Scientia Hort. 19:363366. Haas-von Schmude, N.F. 1983. Klonale Massenvehrung von Phalaenopsis. Die Orchidee 34:242248. Hinnen, M.G.J., R.L.M. Pierik, and F.B.F. Bronsema. 1989. The influence of macronutients and some other factors on growth of Phalaenopsis hybrid seedlings in vitro. Scientia Hort. 41:105116. Homma, Y. and T. Asahira. 1985. New means of Phalaenopsis propagation with internodal sections of flower stalks. J. Japan. Soc. Hort. Sci. 54:379387. Intuwong, O. and Y. Sagawa. 1974. Clonal propagation of Phalaenopsis by shoot-tip culture. Am. Orchid Soc. Bul. 43:893895. Kirsch, O.M. 1960. Breeding of Phalaenopsis hybrids. Third World Orchid Conf. Proc., London, England. Knudson, L. 1922. Non-symbiotic germination of orchid seeds. Bot. Gaz. 73:125. Krizek, D.T. and R.H. Lawson. 1974. Accelerated growth of Cattleya and Phalaenopsis under controlled-environmental conditions. Am. Orchid Soc. Bul. 43:503510. Kubota, S. and K. Yoneda. 1993. Effects of light intensity on development and nutritional status of Phalaenopsis. J. Japan. Soc. Hort. Sci. 62:173179. Martin, T. 1988. Once upon a windowsill. Timber Press, Portland, OR. Morel, G. 1960. Producing virus-free cumbidiums. Am. Orchid Soc. Bul. 29:495497. Ota, K., K. Morioka, and Y. Yamamoto. 1991. Effects of leaf age, inflorescence, temperature, light intensity and moisture conditions on CAM photosynthesis in Phalaenopsis. J. Japan. Soc. Hort. Sci. 60:125132. Park, Y.S., S. Kakuta, A. Kano, and M. Okabe. 1996. Efficient propagation of protocorm-like bodies of Phalaenopsis in liquid medium. Plant Cell Tissue Organ Culture 45:7985. Poole, H.A. and J.G. Seeley. 1978. Nitrogen, potassium and magnesium nutrition of three orchid genera. J. Am. Soc. Hort. Sci. 3:485488. Porat, R., A. Borochov, A. Halevy, and S. ONeill. 1994. Pollinationinduced senescence of Phalaenopsis petals. Plant Growth Regul. 15:129136. Post, J.H. 1985. Production and marketing of orchids. RHS International Centenary Orchid Conf. Proc., London, England. Reisinger, D.M., E.A. Ball, and J. Arditti. 1976. Clonal propagation of Phalaenopsis by means of flower-stalk node cultures. Orchid Rev. 84:4552. Ratsek, J.C. 1932. Preliminary experiments on nutrients and the pH of water and nutrients as they affect growth of orchid seedlings. Am. Soc. Hort. Sci. Proc. 29:558561. Rotor, G.B. 1949. A method of vegetative propagation of Phalaenopsis stem cuttings. Am. Orchid Soc. Bul. 18:738739. Rotor, G.B. 1952. Daylength and temperature in relation to growth and flowering of orchids. Cornell Expt. Sta. Bul. 885:147. Sagawa, Y. 1961. Vegetative propagation of Phalaenopsis stem cuttings. Am. Orchid Soc. Bul. 30:808809. Sakanishi, Y., H. Imanishi, and G. Ishida. 1980. Effect of temperature on growth and flowering of Phalaenopsis amabilis. Bul. Univ. Osaka Pref. 32:19. Sheehan, T. 1960. Effects of nutrition and potting media on growth and flowering of certain epiphytic orchids. Third World Orchid Conf. Proc., London, England. Shoemaker, J. 1957. An economist view of the orchid industry. Second World Orchid Conf. Proc., Honolulu, Hawaii. Tanaka, M. 1987. Studies on the clonal propagation of Phalaenopsis through in vitro culture. Bul. Fac. Agr. Kagawa Univ. 49:185. Tanaka, T., T. Matsuno, M. Masuda, and K. Gomi. 1988. Effects of concentration of nutrient solution and potting media on growth and chemical composition of a Phalaenopsis hybrid. J. Japan. Soc. Hort. Sci. 57:7884. Tokuhara, K. and M. Mii. 1993. Micro propagation of Phalaenopsis and Doritaenopsis by culturing shoot tips of flower stalk buds. Plant Cell Rpt. 13:711. Tse, A.T., R.J. Smith, and W.P. Hackett. 1971. Adventitious shoot formation on Phalaenopsis nodes. Am. Orchid Soc. Bul. 40:807810. Veitch, H.J. 1886. The hybridization of orchids. J. Royal Hort. Soc. 7:2249. Wang, Y. 1995. Phalaenopsis orchid light requirements during the induction of spiking. HortScience 30:5961. White, E.A. 1942. American orchid culture. A.T. De LaMare, Co., New York. Withner, C.L. 1942. Nutrition experiments with orchid seedlings. Am. Orchid Soc. Bul. 11:112115. Zhou, T. 1995. In vitro culture of Doritaenopsis: comparison between formation of the hyperhydric protocorm-like bodies (PLB) and the normal PLB. Plant Cell Rpt. 15:181185. Zimmer, K. and W. Pieper. 1977. Zur vegetativen Vermehrung von Phalaenopsis in vitro. Die Orchidee 28:118122.